Debris that closely resembles a flaperon from a Boeing 777 was found on Réunion Island in the Indian Ocean, southeast of Madagascar. If confirmed, this could be the first evidence of Malaysia Airlines Flight 370’s crash, which disappeared in March of 2014 with 227 passengers and 12 crew aboard. A flaperon is a surface on the trailing edge of the aircraft’s wing, controlling how the aircraft rolls. Flaperons provide the function of both a flap and an aileron and can reduce the aircraft’s weight with one part doing the job that would normally be done by two. The video below shows a Boeing 777’s flaperons being tested while on the ground. 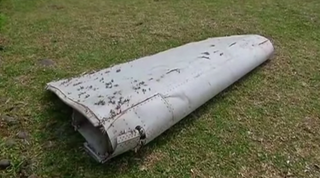 CNN is reporting that the flaperons used on the Boeing 777 contain a specific feature that has allowed investigators to identify the debris as likely to be a genuine part from the aircraft. However, what the flaperon’s distinguishing feature that allowed the identification to occur remains unclear. Aircraft parts all carry some identifier, such as a part number or serial number. Wired is reporting that “BB670” was inscribed on the part. Flight Club has not been able to confirm this claim. If confirmed to be a flaperon from a Boeing 777, all indications will be that this is wreckage from the lost airliner. No other 777 has been lost over the ocean, and the flaperon used on the 777’s wing is unique to the aircraft. Malaysia Airlines Flight 370 took off from Kuala Lumpur on the evening of March 8th, 2014, headed for Beijing. The flight normally took just over five and a half hours, but minutes after confirming to regional air traffic controllers that it had reached Flight Level 350 (35,000 feet), the aircraft was never heard from again. The mystery of MH370’s disappearance has puzzled experts worldwide, leading to widespread theories as to its whereabouts and cause of disappearance. For the families of the passengers and crew lost in the flight’s disappearance, today’s news could be the first step in gaining closure from the fruitless search for the vanished jet.